Compacted soil is the slow-moving freight train accident of lawn problems. It doesn’t happen all at once, but it just gradually chugs along, spreading toxic chemicals around the train tracks and causing traffic snarls for miles around. Oh, wait. That’s a freight train accident. Compacted soil might not be quite that bad, but it’s still a big problem for your lawn. Runoff can end up in your basement, and the grass can be, well, less green than the grass on the other side of the street. Here’s what you need to know about compacted soil, how to prevent it, and how to fix it when it happens. How Does Compacted Soil Affect Lawns? How Do I Loosen Compacted Soil? How Do I Prevent Compacted Soil? 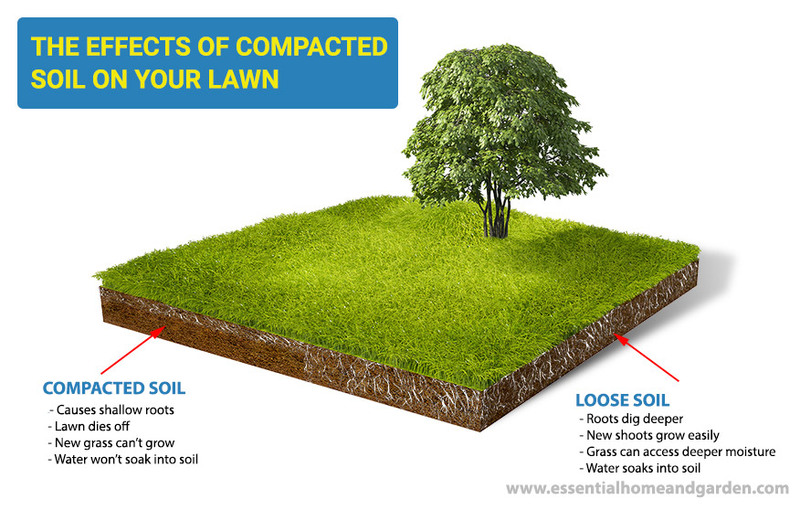 Compacted soil is soil that gets packed down so tightly that grass roots can no longer penetrate it. This causes a number of complications, not least of which can be your lawn dying off. We’ll get into that some more in a minute. Soil compaction can happen for a number of reasons, but it generally happens in ground that has been disturbed for some reason and refilled. 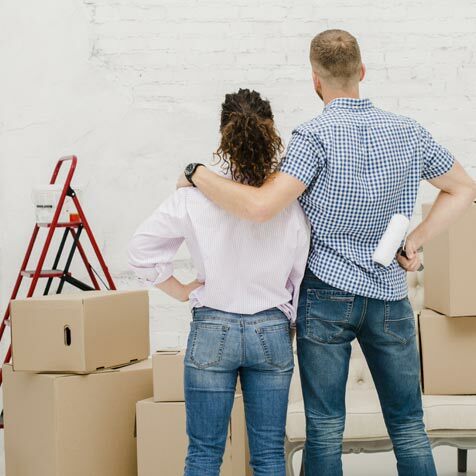 For this reason, it’s more common in newer neighborhoods than on older properties, since the ground around older houses has had more time to settle. When landscapers finish a project, like building a retaining wall or filling in an in ground pool, they do their best to tamp down the lower layers of rock to avoid the upper layers settling. Unfortunately, even the best landscapers can make a mistake, and air pockets are often left underground. Over months and even years, the ground slowly settles, leading to an uneven surface that’s hard for roots to penetrate. Compacted soil affects lawns in a variety of ways. To begin with, compact soil is often too tight for roots to penetrate. Your grass depends on its roots for water and mineral nutrients. When roots can no longer penetrate, your grass will stop growing, and new blades of grass will stop replacing older, dead blades. Over time, your lawn will start to look thin and unhealthy. Worse yet, compact soil can even be too tightly packed for water to get through. When this happens, even healthy blades of grass will no longer get the water they need, since the water won’t be getting past the surface of the ground. This can lead to your lawn turning yellow and grass dying off. If your grass is dying and you can’t figure out why, go outside and try to stick a spade in the ground. If you can’t, the soil is almost certainly to compact for water to penetrate efficiently. 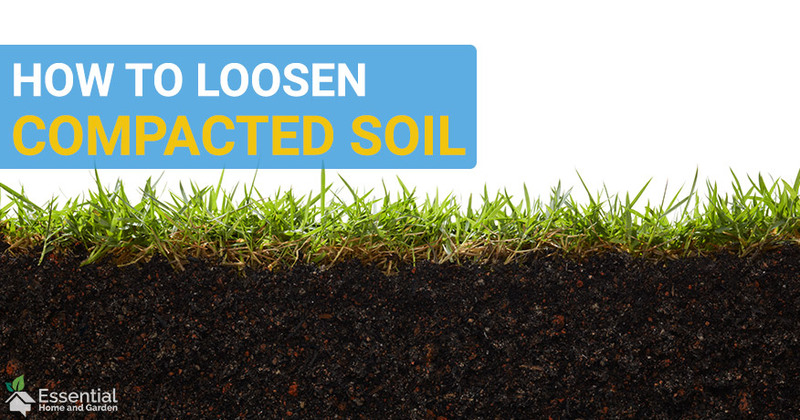 Finally, compact soil can affect more than your lawn. If water can no longer penetrate the soil, it will flow across the surface to the most convenient spot. If that spot is a basement window or a crack in a foundation wall, you can quickly end up with a flooded basement. This can lead to major damage, and expensive homeowners insurance claims. This depends on how badly compacted your lawn is. For a lawn where only the top layer of soil has gotten compacted, the simplest option may be to aerate your lawn. Aeration loosens up the top level of soil without a lot of invasive digging that will disturb your grass. You can have this done by a professional, or rent a lawn aerator yourself at a rental shop. If aeration doesn’t do the trick, you may need to dig a little deeper. A heavy duty roto-tiller can dig up to a foot deep, and will turn over all the topsoil and loosen it. On the plus side, this is enough to fix all but the worst compacted soil. On the downside, this method completely turns over the soil. You’ll need to re-seed your lawn, or put down sod to replace your grass. In the worst cases, you may need to excavate the affected area and fill it in with gravel first. This is generally only the case if you’re dealing with a sinkhole or other geological issue. Needless to say, this kind of problem is beyond the scope of most homeowners, and you should probably hire a professional. As with many home improvement issues, an ounce of soil compaction prevention is worth a pound of expensive roto-tilling cure. Aerating your lawn regularly will keep the top layer of soil loose, so your grass will get plenty of water. Normally, you shouldn’t have any issues with deeper soil compaction. If you do need to have a major landscaping project done, like having a pool filled in or building a retaining wall, make sure your landscaper is licensed and insured. Any competent landscaper will do their best to prevent soil compaction, but even the best professionals make mistakes. If they do, you want to make sure they’ve got your back.